A small number of readers have been having issues downloading the patterns from my catalog and from the email newsletter. I just made a change to the server that I hope will help resolve the issue. This is a test download to see if the change solves the problem. You only need to try this test if you have had the problem. Feel free to let me know if you still have trouble. Please be very detailed if you respond. On this 15th anniversary of the terrible event that changed the world. Never forget the almost 3,000 victims who lost their lives. Never forget the 6,000 plus victims who were injured. 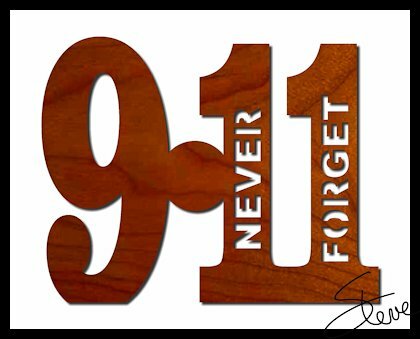 Never forget the hundreds of first responders who risked and lost their lives to help save so many. Never forget the nurses, hospital staff and doctors who worked through the weeks to help survivors. Never forget the thousands who still suffer health effects from the exposure at ground zero. If you are old enough to remember September 11, 2001, the day is probably burned into your mind forever. Of course we will never forget. Will we? It's not hate, it's resolve. It's not anger, it's determination. It's not forgotten, it's remembered! When I sat down to do this pattern tonight I had all these ideas of elaborate designs, graphics and slogans. It dawned on me that none of that mattered. It needed to be very simple. It's the meaning behind the pattern that matters. Anything more adds no more value to that meaning. At 8:45am Eastern time on Sunday September 11th 2016 I will pause and take a few minutes to pay my respects to the victims and honor the heroes of that day.